Located in the famed Carolina Sandhills region, Southern Pines developed as a resort area in the late 19th century. The town and surrounding Moore County are known for their equestrian and wilderness areas, golf resorts and potteries. 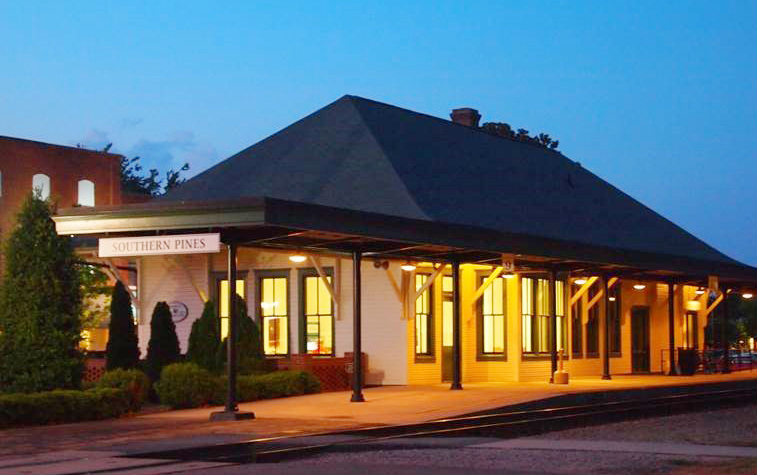 The historic Southern Pines depot is within walking distance of shops, restaurants and galleries that form the core of this town of 14,029 residents (2017 Census). Originally built in 1898 in the Queen Anne style, the depot was returned to its mid-20th century appearance during a 2004 rehabilitation. The town-owned building includes an Amtrak passenger waiting area, the Southern Pines Welcome Center, a Community Room and a recreated stationmaster’s office furnished with historic artifacts. The Southern Pines depot opened in 1898, but was restored by the town and state in 2004 to reflect its mid-20th century appearance. Slowly deteriorating, the depot was rehabbed by the town and state in 2004 to keep it from detracting from the vibrant downtown. Between 2003 and 2005, the years before and after the renovation, Amtrak ridership at Southern Pines (via the daily Silver Star) increased by over 50 percent. The town then sought proposals for activating the depot space, with the goal of leasing it to a tenant and for a use that would be a unique, clear and compatible benefit to downtown. At that time, visitors had no central place to learn about historic, cultural, shopping and dining experiences in the region. Welcome to Southern Pines Inc., a non-profit organization, submitted the winning proposal to open a community Welcome Center. The group’s mission is to greet visitors, share the history of the town and train station, and operate a cultural history museum. – Suzanne Coleman, president, Welcome to Southern Pines Inc. Responding to requests from the business community, the Welcome Center also ensures public restrooms are available downtown. The center is funded through private donations, sponsorships and sales of unique, train-related merchandise, including train station puzzles, hand-made soaps, postcards and more. Left to right: Welcome to Southern Pines Inc., board members pose in the Welcome Center’s gift shop; the rolltop desk used by the last station master is on display along with other artifacts. The town rents the Welcome Center space to Welcome to Southern Pines Inc. for $1 per year. The building systems, exterior and areas outside of the center are maintained by town staff. The Community Room can be rented short-term through the town’s Recreation department. It is rented approximately 50-60 times per year for everything from birthday parties to worship services, and town staff also utilizes it for recreation programs about 50-60 days per year. A roster of about 25 volunteers operates the Welcome Center. It is open five days a week during business hours and is staffed in three-hour shifts. Volunteers, who are also town residents, possess a knowledge of Southern Pines’ history, the train station and Amtrak so they can answer visitor questions. They are also familiar with the downtown retail businesses, restaurants, local sights and cultural offerings, and can provide directions. Residents and visitors gather for a holiday tree-lighting ceremony at the depot. The Welcome Center receives on average 400-550 visitors/month, with spikes during holidays and events like the Annual SpringFest Arts & Crafts Show and the Christmas Parade. In a typical year, it receives guests from all 50 states and more than a dozen foreign nations. Recently there’s been an effort to restore/re-create the stationmaster’s office and develop a rotating exhibit of photos highlighting local history. Reuse of depot to serve as a tourist and cultural center, rail passenger station and events space. Community Room functions as a public amenity that also produces rental income for the city. Depot remains active throughout the day and serves as a centerpiece of local tourism promotion. Continuing efforts to engage the community through events that take place at and around the depot. Thank you to Suzanne Coleman and Reagan D. Parsons for their assistance with this case study. Images courtesy of Welcome to Southern Pines Inc.